CROATIA: Violence At Gay Pride - Joe.My.God. Stone-throwing extremists have disrupted a gay pride march in Croatia, a day after the Balkan country was given the green light to join the European Union. State television has reported that dozens have been detained and several were injured Saturday in the conservative coastal town of Split. Croatia has pledged to protect human rights as part of efforts at EU membership. 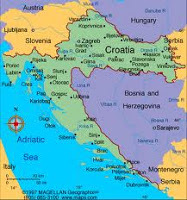 EU officials said Friday that Croatia could join in 2013. State TV said around 200 people participated in the pride march, while thousands of opponents lined the streets in protest. The report says riot police prevented direct clashes. Extremists threw rocks, bottles and firecrackers at the participants.